We already know the significance of 38% fibonacci retracement level in trading. 38% fibonacci retracement level plays effective role when the start and end point of fibonacci retracement tool covers a long move. 50% fibonacci retracement represents strong support when the start and end point of fibonacci retracement tool covers a small move. Every traders wants to identify the reversals as early as possible, and we are concerned of the matter. 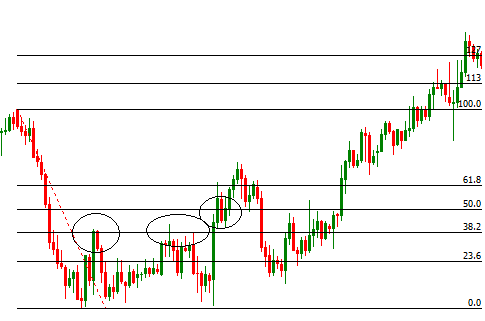 In the above image fibonacci retracement levels are drawn, where the vertical distance between the 0% and 100% fibonacci retracement levels is relatively small. Market found support at the 50% fibonacci retracement level. The question comes from common sense is "Does the 50% fibonacci retracement level always represent strong suppport/resistance?". The simple answer of this question is "No, it does not". 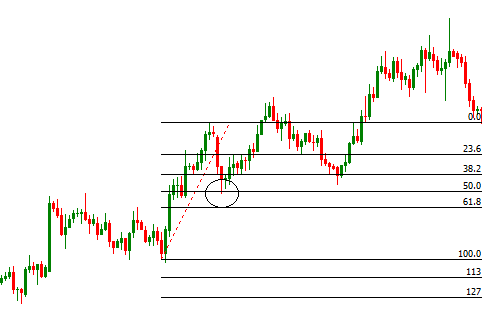 A 50% fibonacci retracement level represents strong support when the price reaches the retracement level without any correction before reaching the level. In the above image we can see from the 0% fibonacci retracement level price reaches the 50% retracement level, without any correction on the way. So, we find a key principle that if the price reaches the 50% fibonacci retracement level with out any prior correction then 50% fibonacci retracement represents a strong support. Second principle is that when the price reaches the 50% retracement level and the price made corrections before reaching the 50% retracement level, there is higher probability of 50% fibonacci level breakouts. In the above image, we can see the principle illustrated. The third principle is that every time price reaches the 50% fibonacci retracement level, the probability of 50% fibonacci retracement level breakouts increases. For example, when price reaches the 50% fibonacci retracement level for first time, the probability of 50% fibonacci level breakout is nearly 0. When the price reaches the 50% fibonacci retracement level for second time, the probability of 50% fibonacci level breakout increases to 70%. If in an exceptional situations the principles are found to be invalid, it is highly expected that the market will make a strong move towards the opposite direction. Dear Traders, these principles are not recommended to be applied to find entry and exit signals rather they can be applied to understand the market behavior and movement. If you have any question regarding this post, you can drop it into the comment section below. You can also subscribe yourFXguide to receive updates right into your inbox. Simply, enter your email address into the email subscription box and click subscribe, then sign into your email address and click the confirmation link. Thank you !! !